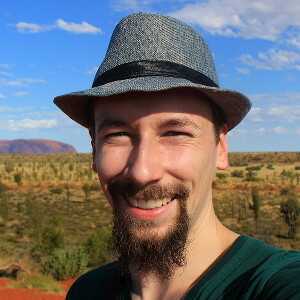 The best advice for long term travelers? Slow down. Seriously. It’s better to see less in a comfortable pace instead of rushing through the sights, quickly collecting destinations like they’re groceries on a shopping list. Of course, you can also ignore that piece of advice and dash around from one place to another with no sense of control. Now that I think of it, I have to admit that squirreling around can be very entertaining, too. At least it was when I visited Hampi. Lakshmi, the temple elephant of Virupaksha temple takes a bath every morning. India is huge. And because India is huge, it means that it takes a lot of time to go from one place to another – even if the places are in the same part of the country. 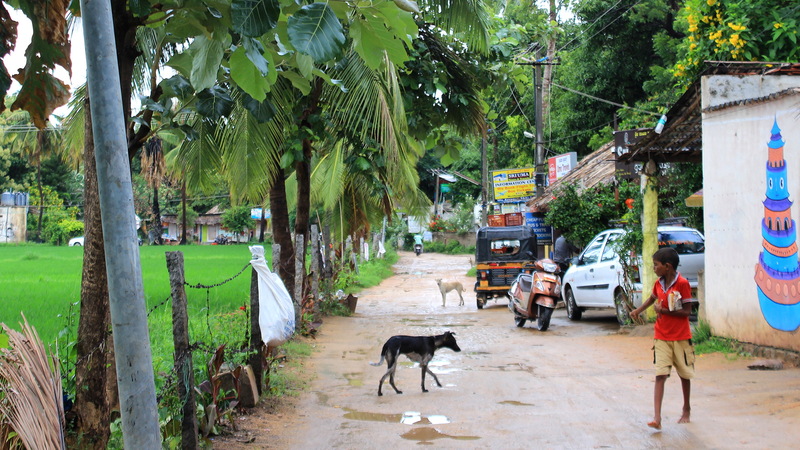 After an excellent stay in Gokarna, I continued north along the west coast of India and went to Goa for a few days. I needed to reach Delhi in a week to meet a Finnish a friend, so I didn’t have too much time to wander around. 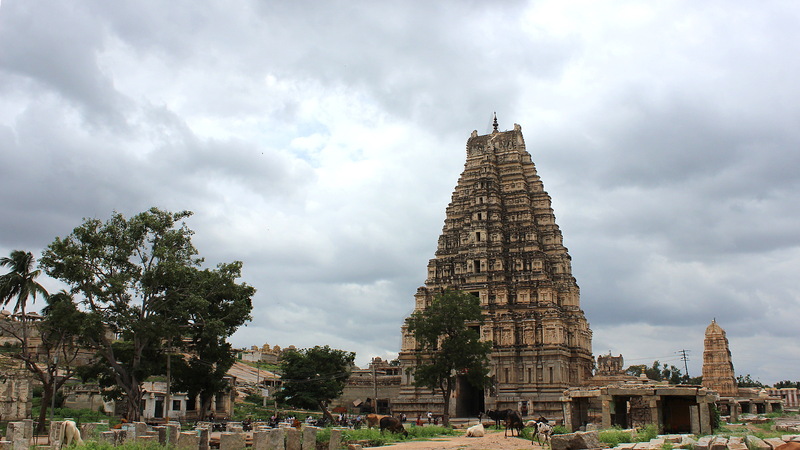 Still, I checked that I had the time to visit Hampi. I just had to limit my stay there to just three days and travel into and out of the destination on overnight sleeper buses. There were no direct connections from Goa to Hampi available during the Monsoon season, so I took a sleeper bus to another city called Hubli halfway along the way. I spent the wee hours of the night at the Hubli train station, got on a train at 6 am and reached Hospet, the city closest to Hampi before noon. 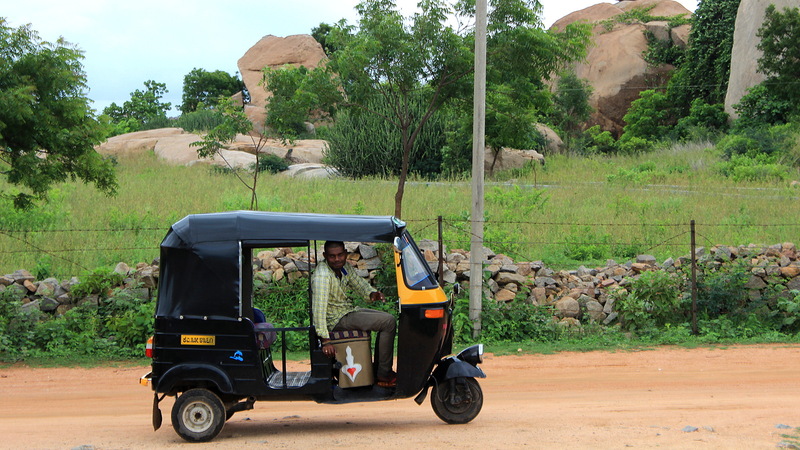 From Hospet, I took an auto rickshaw to Hampi from an entertaining young driver who offered to drive me to Delhi, too. I turned down the offer, but I have to admit that the idea of spending a week in a rickshaw on a 2000 kilometer journey sounded almost tempting! Hampi is a small village, so the Hampi Bazaar was relatively quiet even though the destination is popular with tourists. Crossing the Tungabadra River cost 10 Indian rupees (about 0.15 euro). 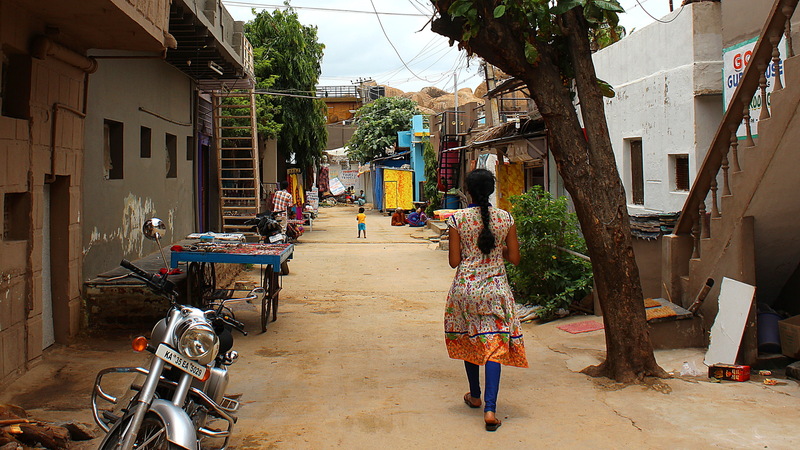 I had chosen an accommodation in Virupapur Gaddi, which is a tranquil area near Hampi Bazaar. 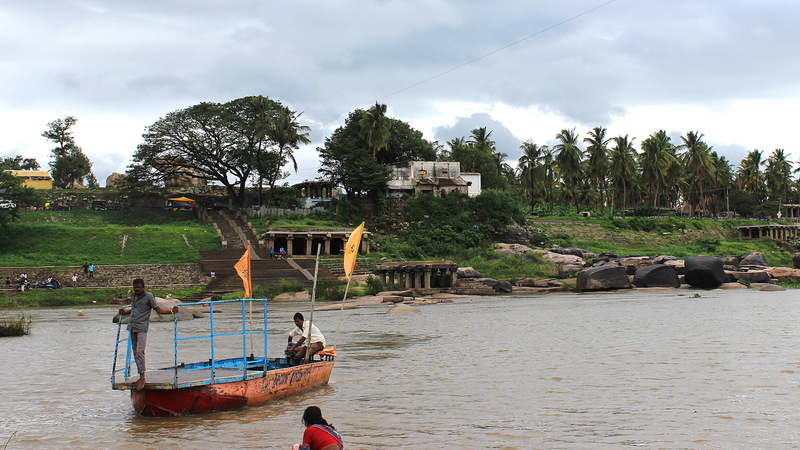 However, to reach Virupapur Gaddi, one must take a boat ride across a narrow river. The crossing of the few dozen meters wide Tungabhadra River takes just a few minutes, but the change in the atmosphere is clear. Most of the shops and sights are on the other side, so Virupapur Gaddi feels very relaxed in comparison. I was quite tired when I got my room key, so I just ate a late breakfast and took a nap. I didn’t have enough time to see Hampi after my siesta and lunch, so I spent the rest of the first day relaxing and writing at the guesthouse. Local kids would frequently show up at the guesthouse in Virupapur Gaddi to sell postcards and maps. During my whole stay in Hampi, I never got working electricity in my cabin at the guesthouse. Once it got dark, I had to move around with my torch to find my around, but it wasn’t the darkness that made my first night difficult. Instead, I once again had trouble with the insects of India. Because the ceiling fan didn’t work without power, the room was a bit hot and humid and sleeping under a blanket was uncomfortable. However, if you put any of your limbs out in the open, they quickly became buffet tables for all the insects of the room. 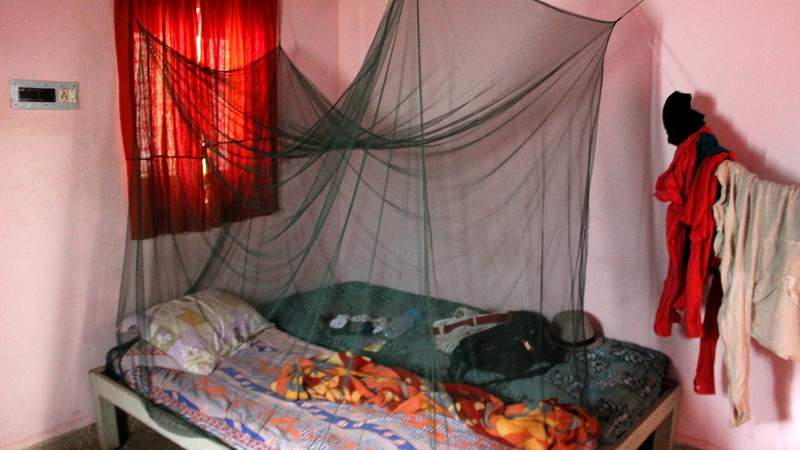 I installed my mosquito net for the first time on my second night in Hampi. Definitely worth it. Once I thought I had enough of bugs for the night, I was taken by surprise by yet another sneak attack by the troops of the Indian Ant Forces. Last time, they brought their squadron to my food supplies when I left an open snack bar package in my shoulder bag. This time, they found something interesting from my medical supplies and invaded the textile bag that included most of my meds and hygiene items. I’ve had many liquids leaking in the bag during the trip and the humidity of the Monsoon season has done some damage to my supplies, so I can understand the ants decision to attack. But still, understanding doesn’t mean that I enjoyed the situation! I noticed the assault at 1 am when I got out of my bed to search for something in my med. During my nightly freak-out mode, I threw away a lot of pills and packages that I deemed unusable to the trash. 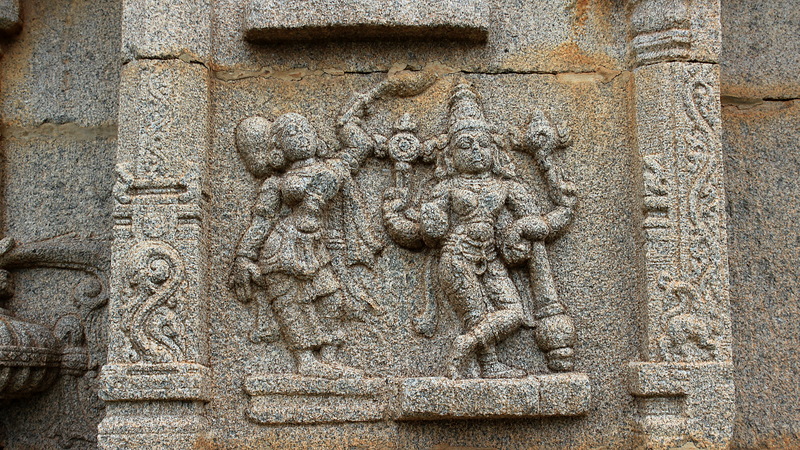 The Virupaksha Temple, built in the 7th century is one of the older buildings of the area. The temple has been upgraded over the years and it’s still actively used. 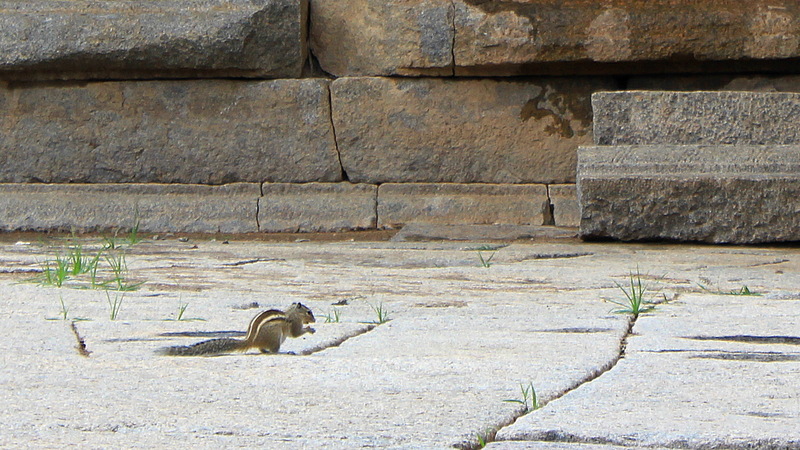 Of course, I didn’t just battle the forces of nature during my stay in Hampi. I did also go to see the sights of the UNESCO World Heritage Site during my second day. To save time and energy, I hired myself a rickshaw driver – a very easy task, because the groups of drivers gathered like birds of prey, just waiting for new tourists to appear from the other side of the river. And because it wasn’t high season, the friendly vultures may have been even hungrier than usual. My rickshaw driver didn’t visit the sites. Instead, he’d wait in his vehicle as I strolled at the ruins. The Virupaksha Temple was the most crowded of all the sites that I visited, but it was still relatively quiet. My driver turned out to be a nice, relaxed guy. He drove me around the vast area of the city ruins and let me see the ruins at my own pace as he waited in the vehicle. The Lonely Planet guide suggests that you can also hire a guide to come with you on the rickshaw. This probably makes the tour more interesting. Another popular option is to rent a bicycle or scooter to visit the ruins on your own, but I didn’t want to do this during my limited stay. Many of the structures were full of small carvings and details. 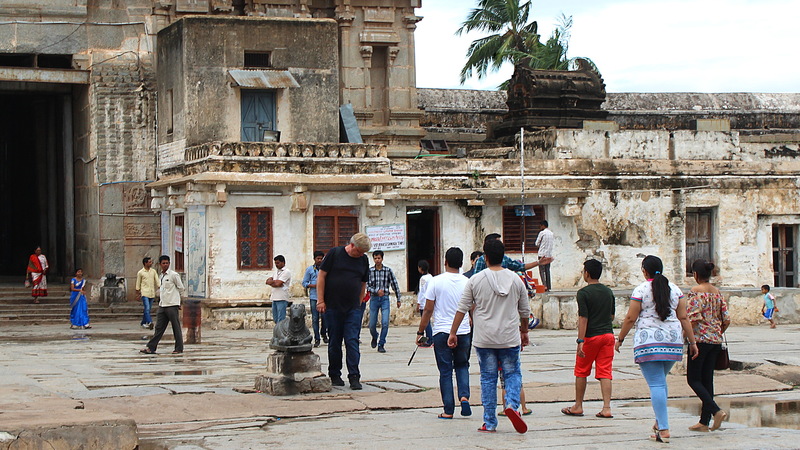 And are the groups of monuments at Hampi really worth all the praise? Well… um… Well, they are ruins. Nothing more, nothing less. The sites are spread in a very large area, so you don’t get to see one massive ancient city. Instead, the old buildings are in separate clusters, some of which are more impressive than others. The most visually striking sight is the 50 meters high gateway of the Virupaksha Temple, located on the banks of the Tungabhadra River. The ruins are beautiful, but I’m starting to understand why I’m so often left unimpressed by popular tourist sights. I like to watch films that give me new thoughts and I read books that teach me new things. 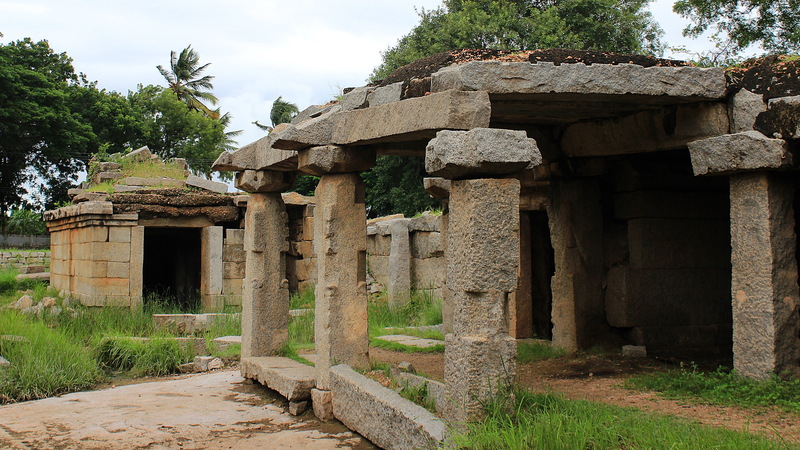 For most of the time, the ruins of Hampi did not offer me anything new or surprising. If I had to name my favourite destinations in India, I’d always choose my hostel in Gokarna or the organic farm of my CouchSurfing hosts in Kerala over all of the popular tourist sights. 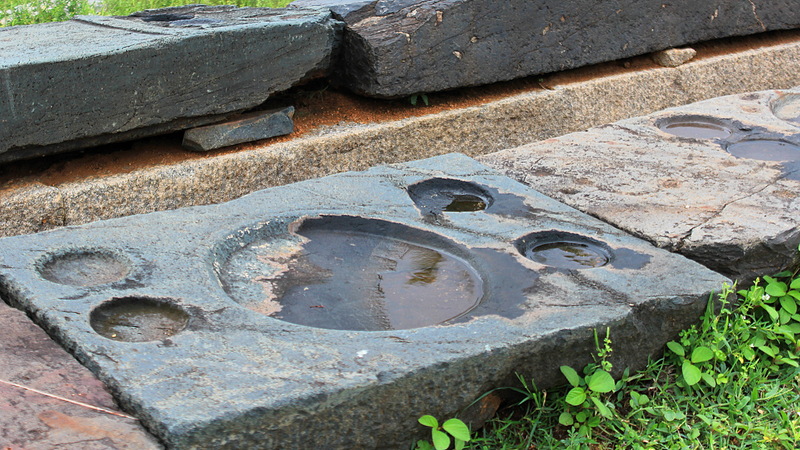 The thing that got me most excited in Hampi? These historical “plates” carved in stone. It had never crossed my mind that one could create permanent food holders like this! 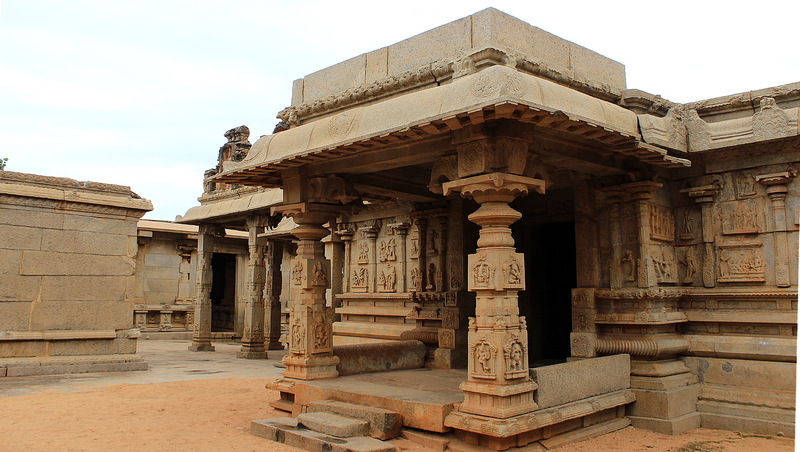 Hampi is also very touristy, which means that you don’t often get a chance to venture alone. The numerous sales vendors, rickshaw drivers and other tourist workers are there for you, whether you like it or not. On a positive note, most of the ruins themselves had surprisingly few visitors during the off-season, so you could find some peace of mind there. 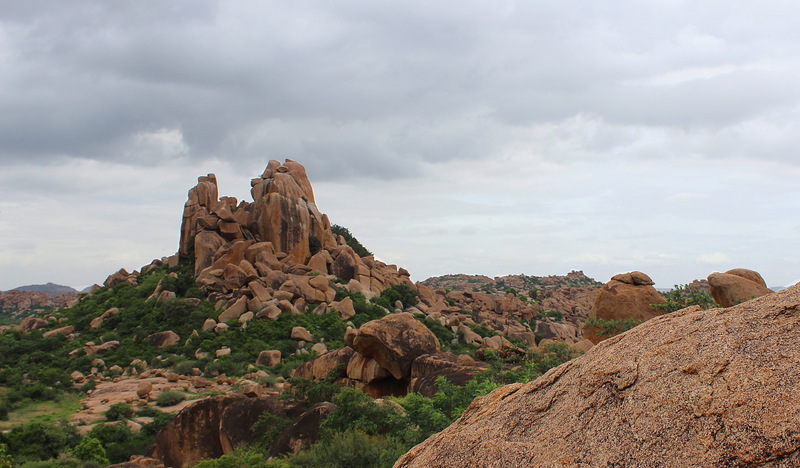 The landscape of the hills around Hampi is very unique and striking. 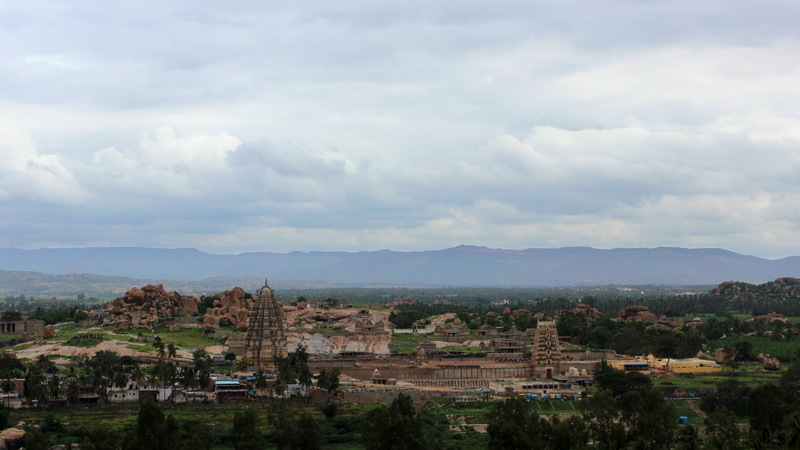 During my last day, I got a glimpse of Hampi at its best. I went for a walk on the more tranquil side of the river. Once I had left my accommodation and walked for a few minutes along the road, the buildings quickly disappeared. Instead, the road came to a hard-to-spot walking route up to some rocky hills. I climbed up to the nearest hilltop to enjoy the view. I felt happy and free. 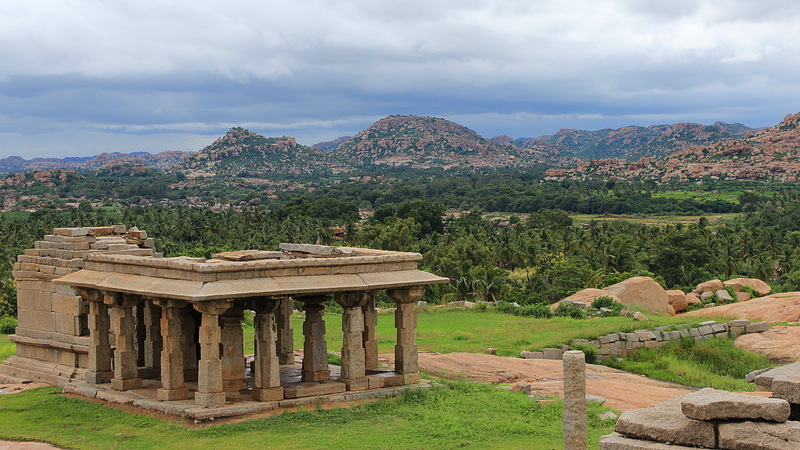 The view to Hampi from the hilltop. 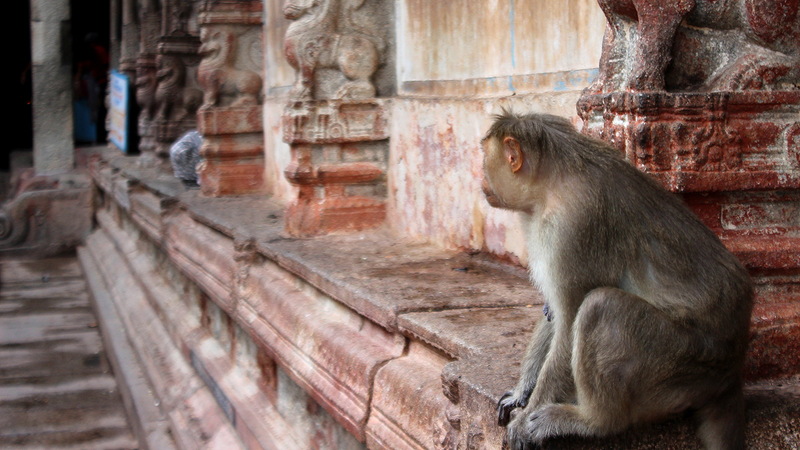 Like so many other sights of Asia, Hampi has plenty of monkeys. This guy tried to search inside the bag seen in the background, but he had to flee when the owner noticed what was happening and threw a stick to chase him off. I had considered my journey to Hampi a bit chaotic, but it was nothing compared to the departure. My sleeper bus to Mumbai left at 6:20 pm, so I had made an agreement with my previous rickshaw driver that he’d wait me on the other side of river at 5 pm. At 4.30 pm, I decided to order one final sandwich at my guesthouse, so I wouldn’t get too hungry during the bus trip. It wouldn’t be too bad if I was late 10-15 minutes, right? Well, the sandwich never arrived, because the waiter forgot to tell about the order to the kitchen. I waited for the sandwich far too long – almost half an hour – before I finally asked about it and figured what had happened. I still had not checked out of the guesthouse. When I finally did that, it also took much, much longer than I had anticipated. I didn’t really have the time to take pictures during my departure. So here’s a photo of yet another ruined building. When I finally left the guesthouse, it was already 5.30 pm. The boats would soon stop crossing the river, so there was a long queue to get back to the other side. It took me another fifteen minutes to get on a boat and across the river. I was glad to see that my rickshaw driver had waited, and although he was clearly annoyed, he kept his cool. Finally, it was time to ride from Hampi to Hospet. Or it would have been, had the rickshaw of my driver would have started. A short downpour just a moment earlier had done something to the engine of the rickshaw and the vehicle just wouldn’t start, no matter how hard my guy and other rickshaw drivers tried. After ten minutes, one of the other drivers agreed to take me to Hospet. The driver did plenty of dramatic overtakings and steered as fast as he could – which, by the way, isn’t very fast when you’re driving a rickshaw. Still, it became clear tha we wouldn’t be in Hospet in time. At first, I was extremely stressed about the situation, but then, something happened inside my head. 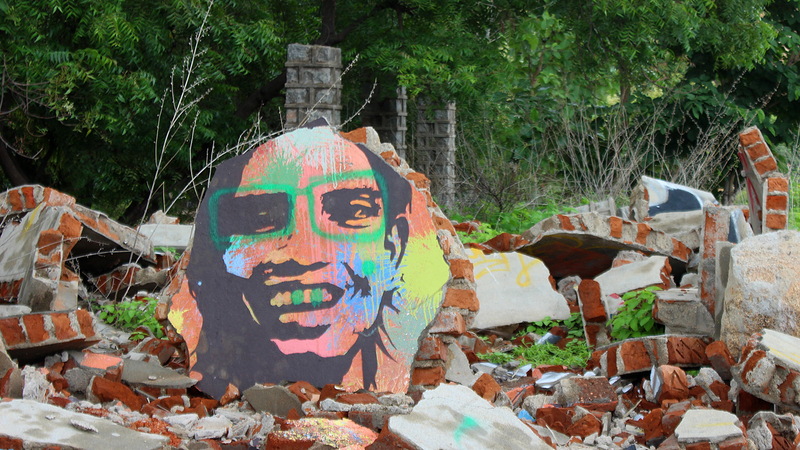 A graffiti in Virupapur Gaddi. Shanti shanti! Maybe it’s my tranquil way of thinking or maybe all my Mindfulness exercises are paying off. Nonetheless, I stopped worrying. I looked at myself through the rear mirror and started to smile. I had no control of the situation and I couldn’t affect the outcome, so I thought might as well sit back and enjoy. When we finally arrived in Hospet, we were five minutes late and the bus had already disappeared. My driver called the bus company and started to chase the transport around the city. Fortunately, the bus had not gone too far and they stopped to wait for us. When we reached the bus, I quickly payed the rickshaw driver, threw my backpack to the luggage storage and found my seat. I was finally on my way to Mumbai. Too bad I didn’t want to go there. lovely blog about an area I so wish to visit. Quite an adventure that. Hampi is one of my favourite places in India. I was there for a week and loved the sights that the place had to offer. In India, though, I liked Chittorgarh Fort in Rajasthan. On a hill top there are temples and castles dotted around a vast area. It was quite exciting to climb ruining castles and watch the sun set in complete solitude. And jog around the site again in the sunrise. I guess one of the reasons why ruins get boring is that they all deteriorate in the same way: no matter how lively and colorful the cities have once been, the remains are usually just rocks and pillars. Sure, I would have probably been impressed by Hampi in its former glory, but there isn’t much left of it anymore. But at least your experience from Chittorgarh Fort sounds great!